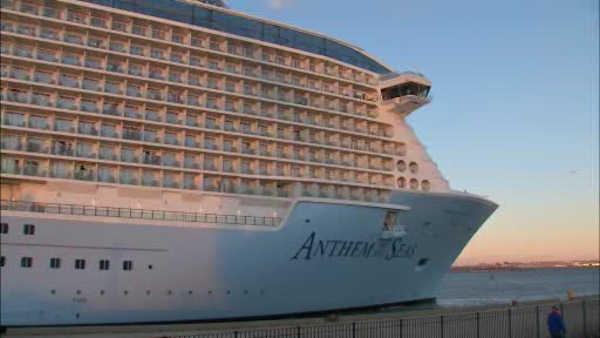 NEW YORK (WABC) -- Passengers were back on the Anthem of the Seas Sunday morning, escaping the cold after the ship had to undergo extensive repairs. The Royal Caribbean cruise ship set sail Saturday in Bayonne. It was back on the water after rough seas damaged the ship off the Carolina coast. The Coast Guard cleared the ship for its latest voyage after part of its propulsion system had to be replaced. And passengers were ready to get on with their trip. On Friday, Coast Guard spokesman Charles Rowe said inspectors were examining part of the Anthem of the Seas' propulsion system that had to be replaced. The left azipod was rendered inoperable during the storm, which packed hurricane-force winds and wave heights of 30 feet. An azipod is a propeller that's mounted to a steerable pod that contains an electric motor. Rowe said that the ship had to meet standards before the vessel could sail. The Anthem was scheduled to leave at 3 p.m. Saturday from New Jersey. The 1,141-foot ship returned early to its homeport of Bayonne on Wednesday night with 4,500 passengers and 1,600 crew members.